It's a celebration of process that encourages everyone to participate in 100 days of making. The great surrender is the process; showing up day after day is the goal. For the 100-Day Project, it's not about fetishizing finished products—it's about the process. 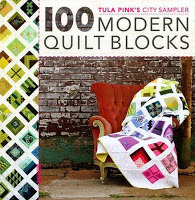 To stretch my technical skills and establish a new rhythm in my creative life I will be using Tula Pink's City book 100 Modern Quilt Blocks. Hopefully I will become a more accrue piecer as I follow along with the author's directions to make 100 6 1/2" square quilt blocks. My two self imposed rules are to first use only fabric scraps from my stash and to use only warm colors. The color rule is only so that if I want to turn the blocks into a quilt there will be some cohesiveness based on the color theory. The book is organized into shape collections such as squares, and triangles. The first section is crosses. Maybe some of these patterns will find their way into my Carrot Top Studio work too! Watch our Instagram and Facebook pages for updates as the days roll by!.